Request a quote for a bulk order for STAT2 monoclonal antibody - Classic. Please fill out the form here below. Your local sales account manager will get in touch with you shortly and send you a quotation based on your requirements. Monoclonal antibody raised in mouse against STAT2, using a KLH-conjugated synthetic peptide. Western blot was performed on 1 μg HeLa whole cell lysate with the STAT2 monoclonal antibody (Cat. No. C15200210). The blot was blocked with 1% BSA in TBST for 30 min at RT, then washed and incubated with the Diagenode STAT2 antibody diluted 1:1,000 in 3% BSA/TBST overnight at 4C. 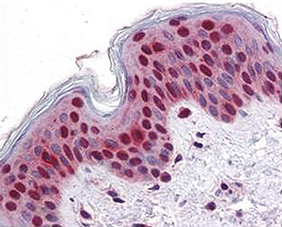 The Diagenode STAT2 monoclonal antibody was used at a 2.5 μg/mL to detect STAT2 in squamous epithelium from human skin (40X) showing moderate to strong nuclear and faint to moderate cytoplasmic staining (figure 2). Expression of STAT2 is expected to be cytoplasmic, and nuclear upon activation. The image shows the localization of the antibody as the precipitated red signal, with a hematoxylin purple nuclear counterstain. Tissue was formalin-fixed and paraffin embedded. Diagenode strongly recommends using this:	STAT2 monoclonal antibody - Classic (Diagenode Cat# C15200210 Lot# 001). Click here to copy to clipboard.